Adam Hayes command 8 battalions of Danish Infantry which fought hard to dislodge the French from the anchor position of a village on the Jacobite right flank. 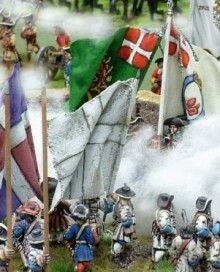 Here the French defend manfully as the Danes press north of the village. The Duke of Wurttemberg was apparently shot through the head by a marksman at this spot. A link to the Grenadier Storming party which can be mixed with the existing grenadiers to form a very dynamic group of models.